And, their tees are cute as ever. 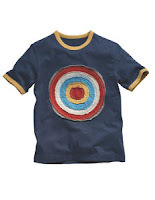 They updated their popular bulls eye t-shirt from a few seasons ago and it looks really cute. I can’t wait to see my nephews in the new designs.